Estée Lauder "Future History Maker" Award Winners at Latina History Day. honorees. 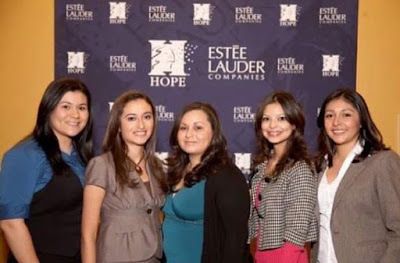 The Estée Lauder Company helped celebrate five college students who are chosen each year based on grade point average, community service, and recommendation as a future history maker. 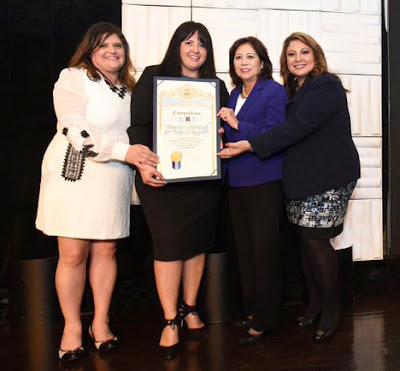 Sylvia Castillo of Union Bank, Teresa Samaniego of ABC7, Anna Klein of The Estée Lauder Company, and Vice Chair of The California Legislative Women’s Caucus Christina Garcia, welcomed five awardees to the stage for the award presentation. This year’s honorees included Karla Ballesteros, Naomi Ogaldez, Rocio Ortega, Alexia Peneda, and Saaron Ramírez. California Secretary of State Alex Padilla presented his remarks to the audience, encouraging them to take part in what will surely be a historic presidential election. He spoke of implementation an important change in California’s voting system – “automatic voter registration,” and encouraged everyone to get not just themselves to the voting booth, but their family and friends, too. Elizabeth Vázquez, the President, CEO, and Co-Founder of WEConnect International, an organization that offers women business owners direction and guidance on how to succeed on the global market, addressed guests as a breakfast speaker. The conference hosted a variety of engaging workshops including “Your Blueprint to Building the Foundation to Your Financial House,” with Financial Expert and TurboTax Spokesperson Louis Barajas. Mr. Barajas provided the financial advice self-determined individuals need to thrive in the new economy and how to eliminate an advisor to do your own taxes. Human trafficking was another important topic covered at the conference. The panel of local elected officials and experts moderated by Rosie Arroyo of the California Community Foundation, helped attendees lay the foundation for safer neighborhoods. Participants learned tell-tale signs to identify victims, how to take action, and skills to lead community efforts to prevent the mistreatment of others. The “Wellness Track” brought participants a workshop titled “Building Your Personal Health Plan” presented by Herbalife and outlined a new approach to a healthy lifestyle. The “Latinas in Sports and Entertainment” workshop was presented by the Los Angeles Dodgers. This exciting Career Track was moderated by sports reporter, Alanna Rizzo, and included four distinguished sports and entertainment Latina professionals. They spoke about their experiences in male-dominated industries and how they are breaking ground for future generations of women-of-color. Ms. Rizzo, an Emmy Award winner, SportsNet LA Reporter, and recipient of HOPE’s “Hope Raising Award,” also hosted the Luncheon. Luncheon guest speakers included two accomplished and empowering filmmakers. Virginia Espino is the co-producer and lead historian of the PBS documentary No Más Bebés which documents the true story about the forced sterilization of women at the Los Angeles-USC County Medical Center in the 1970s. Kamala López, the director of a new film, Equal Means Equal, offered insight to women and equality in our country today. Councilmember Nury Martínez also addressed the luncheon. The Councilmember is an alumni of the HOPE Leadership Institute Class of 2000. A few short years ago, she sat in the audience as a member of the Institute. At this year’s event, she represented Los Angeles Council District 6 and is currently the only woman on the Los Angeles City Council. The HOPE Leadership Institute is the only statewide program focused on training professional Latinas in vital leadership and advocacy skills, enabling them to create fundamental change within their local neighborhoods and across California. Eighteen years later, 469 Latina leaders have graduated from the program: 137 are now commissioners, 46 elected officials, 12 gubernatorial appointees, six presidential appointees and two Judges. The day ended with over 40 Latina and Latino-owned businesses at the ‘Comadre Power Network.’ Josefa Salinas, radio personality at HOT 92.3 The Beat and L.A.’s own, kept everyone moving as the master of ceremonies and networking mixer host. A great end to an exciting day, the combination bazaar, information exchange and mixer transformed the Biltmore’s Crystal Room into a wonderland of gourmet desserts, gifts, clothes, boutiques, jewelry, and art. 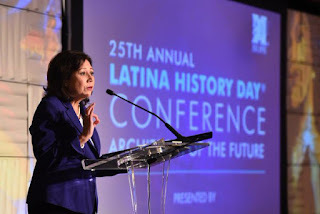 HOPE’s “Latina History Day” was established in 1992 and continues to be the only day where Latinas, their accomplishments, and their contributions are celebrated within Women’s History Month. For more information on HOPE and their many empowering programs, including the HOPE Leadership Institute, visit their website at www.latinas.org.